The “new” good fat! You’ve already heard plenty about DHA, the great-for-you omega-3 fatty acid in fatty fish and algae or fish-oil capsules. Now, research from Harvard Medical School, the Cleveland Clinic (where Dr. Mike is Chief Wellness Officer) and universities in Hawaii and Japan that omega-7 fatty acids found in purified palmitoleic acid have amazing powers, too. They squelched heart-threatening LDL cholesterol and triglycerides, boosted ticker-friendly HDLs, decreased fatty liver and improved cells’ ability to take in blood sugar in several well-designed studies. To help you better understand why they might say this, here is a list of the research articles that they are referencing with a short interpretation of each one. Foundational study that showed that out of 400 fatty acids screened that Omega 7 was most active in regulating lipid metabolism. Showed Omega 7 inhibits SCD1 and positively regulated insulin action and inhibited hepatic steatosis. This same group in December 2011 studied Omega 7 levels in humans and showed, in the study below this one, that it prevented the development of Type 2 diabetes in a population of over 3,000 patients. Follow-up work from Harvard group above, along with NIH and Seattle research centers. Extremely significant study because of the volume of human-related cases that confirmed the importance of Omega 7 and its broad pharmacologic effects. Authors measured trans-palmitoleate because it exclusively comes from dairy sources and therefore is not confounded by endogenous production of C16:1. Standard animal model used in drug development. This study was the first, and only to date, to look at the effect of C16:1 to inhibit plaque formation. Plaque reduction was dramatic, with virtual absence of atheroma at the aortic root in affected animals. Also, effect was seen across the entire population, not just in a few select animals. Effects on plaque development were double that seen for rosuvastatin, the most potent statin. Study was repeated because of unbelief and results were similar. HDL levels increased 85% in first study and ~40% in second. Unsure as to this being “cause & effect” with less plaque. Could be more of an anti-inflammatory mechanism or macrophage inhibition (i.e., TNF, etc). Study showed significant declines in cholesterol and LDL levels. Also, significant declines in TG levels of 16%. 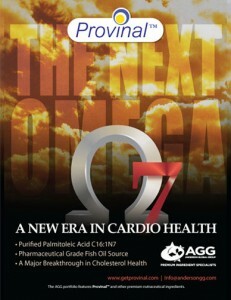 Significant difference between Omega 7 and Lovaza is that LDL is NOT raised. Extremely significant and elegant study. Was first to administer Omega 7 directly, instead of assessing correlations of Omega 7 from dietary or endogenously-created sources. Mouse model used was genetically-manipulated mice to automatically develop Type 2 diabetes. Study showed Omega 7 reduced weight gain, improved insulin sensitivity, reduced hepatic steatosis, reduced TGs, inhibited translational production of TNF-alpha, reduced resistin levels, inhibited FAS and SCD1. Basically, corroborated earlier work by other investigators on the multifactorial and broad mechanisms of action of this fatty acid. Unsure as to correlation of mouse dose with humans – not been studied yet, however, when compared with TG effects with another study in the identical animal model, Omega 7 was shown to have 5x the potency of EPA. The broad effects noted were: increased HDL, decreased total cholesterol/HDL ratios, lower TGs, decreased CRP and lowered insulin resistance by 17%. This work, combined with related basic science and cellular mechanistic investigations proves without a doubt that Omega 7 is pharmacologically active, has clinical significance and is even broader and perhaps more potent than EPA.